Well that certainly explains a lot. First of all, it confirms that all those "split timeline" supporters were correct. Sort of. You see, there are actually three alternate timelines that are formed after Ocarina of Time. And suddenly, everything gets all DBZ. So let's break this down. First of all, it's important to understand the utterly confusing ending of Ocarina of Time, the reason for all this mess. Just follow along, don't think too hard, and you should comprehend it well enough. In OoT, Zelda has a hunch that Ganon is one bad dude, but she can't prove it beyond her crazy dream-visions. In the middle of the game, Link awakens in the future after being sealed away for seven years. In this adult future, Link defeats Ganon and he is sealed away. Then, Zelda magically sends Link back to the past before the start of the game so he can relive the childhood that he missed. Somehow, though, he is completely aware of the events that transpired in the alternate future and confirms to Zelda that her vision is true that that Ganon will take over Hyrule if no action is taken. This creates the child timeline in which Ganon is executed for crimes which he did not yet commit. But there's actually a third timeline which nobody even considered (and for good reason). In this hypothetical alternate future, Link fails to defeat Ganon in the future and Ganon continues to rule Hyrule. The alternate future created when adult Link disappeared leads to The Wind Waker. Because there was no Link (he was sent back in time) to stop Ganondorf from breaking free after adult Link sealed him, Hyrule had to be flooded. The direct sequels to Wind Waker (obviously) make up the rest of this timeline. Link being unsuccessful in defeating Ganondorf during the future of Ocarina of Time results in an alternate universe which is completely 2D. There are a number of interesting things learned in this timeline. For one, Ganon has a hard life. He's always being defeated, sealed in some realm, and revived. More importantly, there's a large chunk of this timeline that doesn't incorporate games, so there's established story we've yet to see. Finally, it's interesting that Skyward Sword, though first in the timeline, is actually not a direct prequel to Ocarina of Time. In fact, several games separate the two. And, of course, after Four Swords Ganon tends to dominate things. 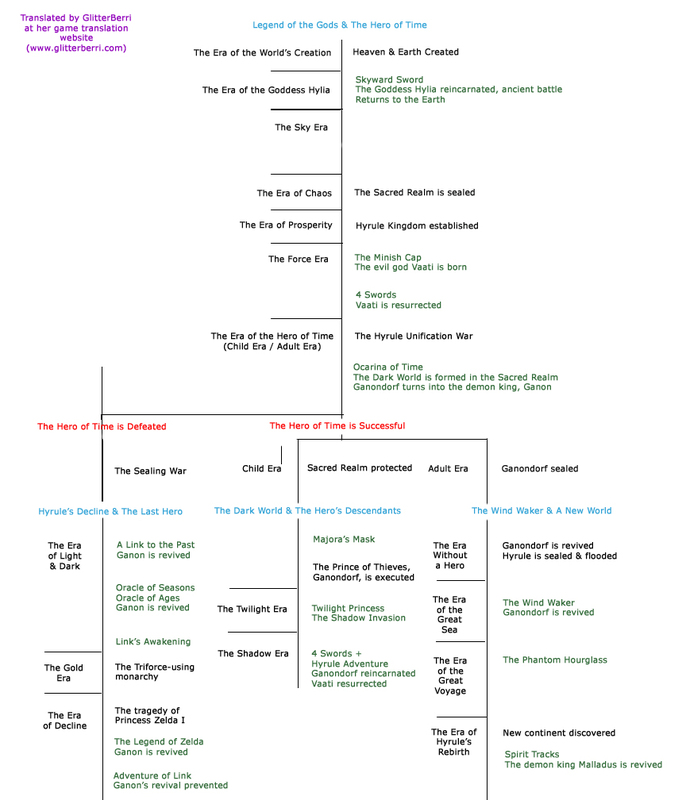 Although slightly confusing, the crazy Zelda timeline is quite fascinating. Plus, that completely blank "Sky Era" really has me curious.